Crockpot Split Pea Soup - Recipes That Crock! Are you looking for that classic homemade split pea soup that grandma used to make? 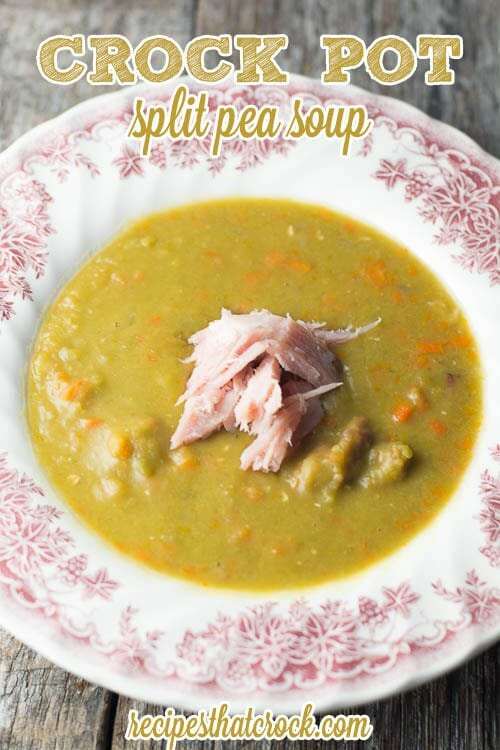 This Crock Pot Split Pea Soup has all the flavors of the old fashioned soup favorite and is the perfect leftover ham recipe. There are those recipes, ya know the ones. Those old-timey recipes that remind you of simpler times. Ham and Beans come to mind as well as classic Tomato Soup and Grilled Cheese. Beef and Noodles would qualify as well as Chicken and Dumplings. Looking for leftover ham recipes? This Crockpot Split Pea Soup has all the flavors of the old fashioned soup favorite and cooks up in your slow cooker. Recipe from Gooseberry Patch's Slow Cooking All Year 'Round. Place all the ingredients into your crock pot and cover with water. Cook on high for 6 to 8 hours stirring occasionally until peas break down and soup becomes very thick. Add additional water to bring soup to your desired consistency. If you are going to have to step away from this soup for a while as it cooks down, I would recommend using an automatic stirring slow cooker although a regular 5-6qt slow cooker will work just fine. This particular slow cooker automatically kicks on every two hours to stir things up nicely.